Develop using IntelliJ IDEA? Check your productivity guide! As a developer, one of the main reasons that I enjoy developing using IntelliJ IDEA is that it has been designed with productivity in mind. 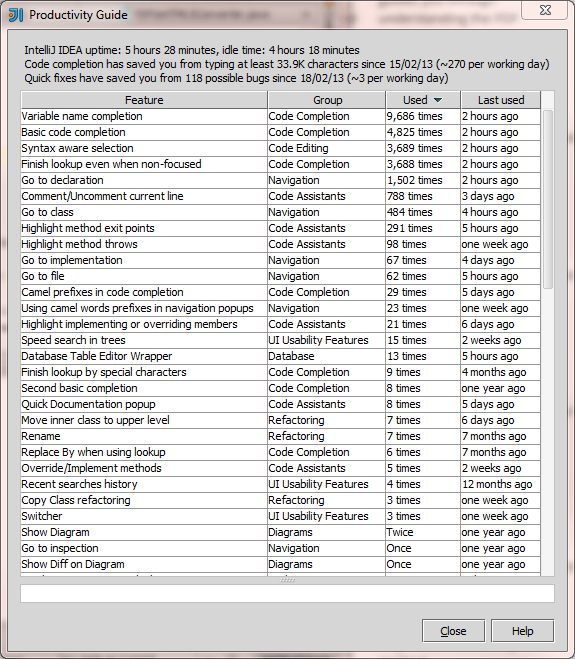 The code completion is fantastic, and there are all sorts of keyboard shortcuts and tools that help you to be more productive and work faster. But exactly what are those features, and how often do you actually use them? It’s relatively well hidden, but IntelliJ IDEA actually tells you this in the Productivity Guide. To find this, click Help | Productivity Guide. In addition to showing you the features that you do use, the productivity guide is also great for showing you the features that you don’t use. If you click on a feature, the panel at the bottom shows you how to use that feature, so you can be even more productive in the future! 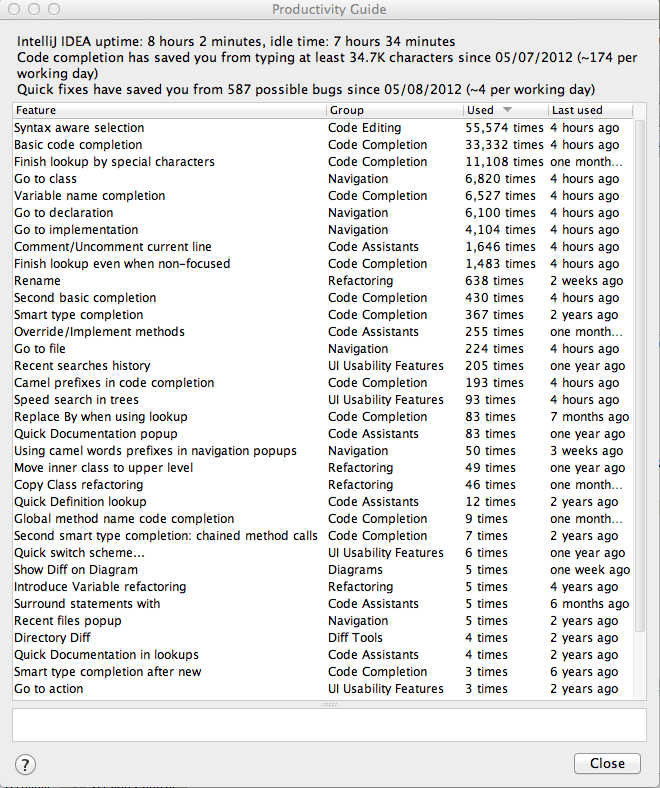 I asked around and managed to persuade the IntelliJ IDEA users of IDRSolutions to pause writing great software for a moment and allow me to grab a screenshot of their productivity guide to compare with my own. We all found it very interesting to compare each others stats, and were very surprised to see the variation between which features we use the most as well as the differences in proportion of the number of uses between the features. Speculating, we put this down to working in differing areas of the code base, as well as personal coding style. Mark’s Guide – A big fan of syntax aware selection. Leon’s Guide – Loves the code completion tools. Sam’s Guide – Likes the code completion tools equally. 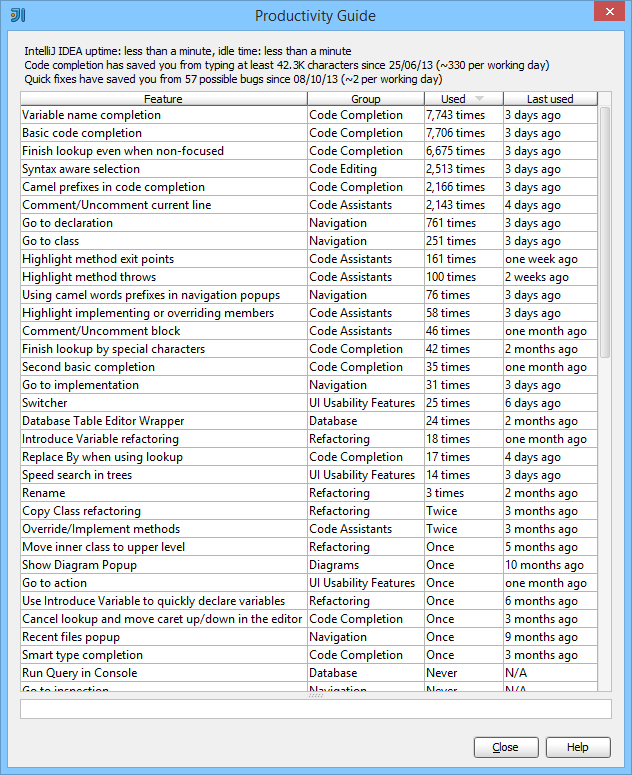 If you are an IntelliJ IDEA user, I highly recommend checking your productivity guide and seeing which features you use the most, and which you’re missing out on. If you have colleagues that also use IDEA, ask to see theirs too and compare them with your own (and ours) – you may find that you’re missing out on a really cool feature!